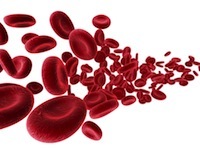 Researchers in Brazil recently stumbled on a rare event involving a pregnant woman with homozygous sickle cell anemia. The woman presented at the hospital with fever, weakness, abdominal pain and hemoglobin levels at 2.4 g/dl. When doctors tracked fetal heart rate, they noticed an abnormality. The patient, 32 weeks pregnant, was given packed red blood cells – five units. After treatment, the pregnancy was carried to 37 weeks and delivered via C-section. This is the first known case of acute splenic sequestration during pregnancy. Doctors believe immediate transfusion of packed red blood cells can prevent further pregnancy and fetal complications. Source: Maia CB, Nomura RM, Igai AM, Fonseca GH, Gualandro SM, Zugaib M. Acute splenic sequestration in a pregnant woman with homozygous sickle-cell anemia. Sao Paulo Med J. 2013 Apr;131(2):123-6.Sao Paulo Med J. 2013 Apr;131(2):123-6.